I know I'm going to get heat for this section as usual. There are folks who have had Moorish idols that thrived on banana chips; still others carrying on clairvoyant relationships with their Ornatissimus butterflies. I've seen this, have mercy! But for most of us mere mortals the following does hold true. Rhinomuraena quaesita Garman 1888, the Ribbon Moray Eel. Ninety nine percent plus do not live a month in captivity. Most starve, refusing all food. Next most common category of loss is escape through the smallest of top openings, or plumbing. Last is "simple stress". The written record shows some people's success with netting food and eel together and shaking, training on select live skewered items; but most black to blue to all yellow female ribbon morays perish within a short while. You've been cautioned. Rhinomuraena quaesita: Fiji image at right or a changeling female and male. Below, a juvenile (black) and male in N. Sulawesi and a female in Mabul, Malaysia. Females are mostly to all yellow in color. Most Gymnothorax species get too big, are too aggressive and strong for all but the most humungous systems. If you're going to try these, watch your fingers, tankmates and lock (yes, lock!) that cover down. For cooler water species, do invest in and run a chiller. species get too big, are too aggressive and strong for all but the most humungous systems. If you're going to try these, watch your fingers, tankmates and lock (yes, lock!) that cover down. For cooler water species, do invest in and run a chiller. Too often offered to the hobby are the Atlantic green G. funebris, to eight feet! Others include G. javanicus, the Javan or Giant Moray (to ten feet!) and G. flavimarginatus to a mere four feet. 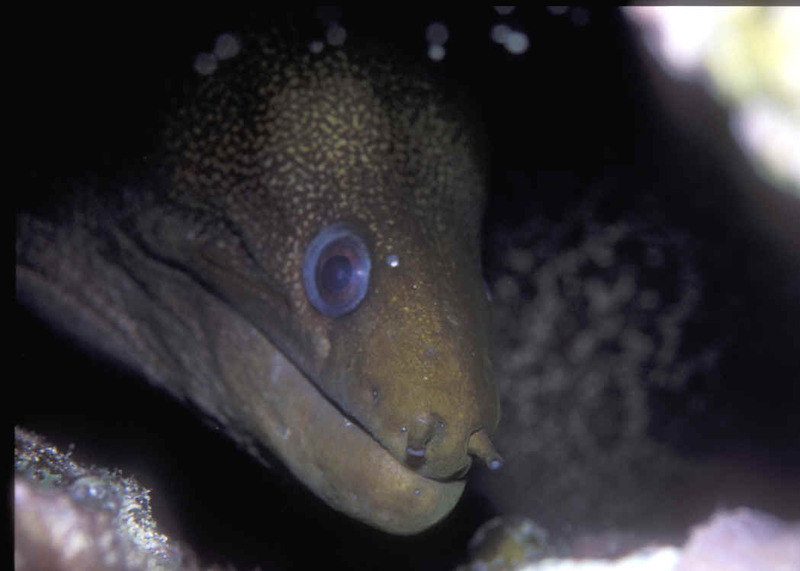 Gymnothorax breedeni McCosker & Randall 1977, the Blackcheek Moray. To a meter in length. Indo-Pacific, sporadically distributed on many island rocky reefs. Very numerous in the Marquesas. Nuka Hiva pix. Gymnothorax castaneus (Jordan & Gilbert 1883), the Chestnut Moray (to science) or Morena Verde. To 150 cm. Eastern Pacific; Sea of Cortez to Ecuador, including the Galapagos, particularly the northern islands of Darwin and Wolf. Aquarium image. Gymnothorax dovii (Gunther 1870), the Speckled or Fine-Spotted Moray. To 150 cm. Eastern Pacific; Sea of Cortez to Ecuador, including the Galapagos, particularly the northern islands of Darwin and Wolf. Wolf images. Gymnothorax eurostus (Abbott 1861), Stout Moray. Light brown with gold spots, tubular nostrils. To about 2 foot in length. Indo-Pacific. 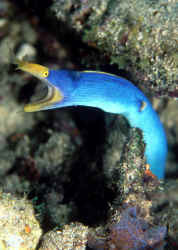 Most common moray species in nearshore Similar to the also common Yellow-Margin Moray, but with a more pointed snout and dark spots on the forward half of the body. Hawaii pix. 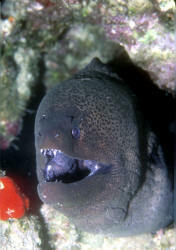 Gymnothorax fimbriatus (Bennett 1832), the Fimbriated Moray. To 80 cm. (32 inches) in length. Indo-Pacific; Madagascar to Society Islands. Feed on fish and crustaceans at night. Nuka Hiva, Marquesas, Polynesia pix. Gymnothorax funebris Ranzani 1840, the Green Moray. Tropical Eastern and Western Atlantic and Eastern Pacific. To about eight feet in length (250 cm.) and 29 kg. A dangerous biting Moray that mainly eats crustaceans and fishes in the wild... most everything in captivity. Best left in the sea or the occasional public aquarium display where this shot was made. 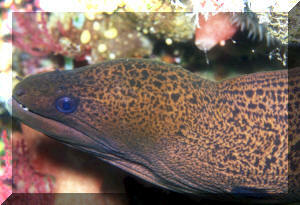 Gymnothorax javanicus (Bleeker 1859), Giant Moray. To ten feet, 3 meters in length. Indo-Pacific; Red Sea, East Africa to Hawai'i. Feeds principally on fishes, secondarily on crustaceans. 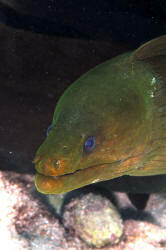 Largest Moray species according to Fishbase. Shown here in the Red Sea and Polynesia. Gymnothorax meleagris (Shaw & Nodder 1795), the White Mouth Moray. Brown to black with numerous white spots. Dark spot around gill opening. Indo-Pacific. Most common Hawaiian puhi/moray. To about forty inches in length. Hawai'i image. Gymnothorax mordax, the California Green Moray eel. 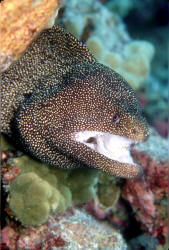 Gymnothorax pictus (Ahl 1789), the Peppered Moray. Indo-Pacific; East Africa to the eastern Pacific, Hawai'i. To five feet in length. This one off Kona. Scuticaria tigrina Lesson 1830, the Tiger Reef Eel. Indo-Pacific; East Africa to the tropical eastern Pacific, including Hawai'i. To 120 cm. in length. Secretive, nocturnal. Found foraging between rocks at night. Aquarium photo. There are some species of muraenids that occasionally enter freshwater in tropical and temperate areas. Click on the link above for coverage. The favored species mentioned make excellent aquarium specimens, a majority of individuals adapting to aquarium care easily, readily accepting prepared foods, neither launching themselves out of your system, nor sampling their tankmates or your hand when doing routine maintenance. Once acclimated to a tank they prove durable, disease resistant pets. Other moray species are problematical, growing too large, escaping even the most heavily covered tank. Many starve outright refusing all food, others consider all within their capacious jaws as fair game. Forewarned is forearmed. The vast majority of muraenids are suitable only for public aquaria or visiting in their domain. It is my opinion that morays provide predatory pressure in a role similar to several sharks, cleaning up the reefs by eating weakened, damaged prey. They should be there. Axelrod, H.R., Burgess, W.E. & R.E. Hunziker III. 1990. Atlas of Aquarium Fishes, Vol. 1 Marine Fish. T.F.H. Publ. Inc., N.J..
Campbell, Douglas C.. 1980. Morays, the Ever Popular Eels. Freshwater and Marine Aquarium. 10/80. Castro, Alfred D. 2001. A freshwater moray eel? AFM 8/2001. Chlupaty, P. Undated. The Leopard Moray, an exciting yet beautiful predator. Aquarium Digest Intl. #37. Esterbauer, Hans. 1994. The Ecology & Behavior of Moray Eels. Tropical Fish Hobbyist. 2/94. Fenner, Robert. 2000. The Zebra Moray Eel, Gymnomuraena zebra. FAMA 7/00. Fenner, Robert. 1995. Moray eels of the family Muraenidae. TFH 3/95. Gonzales, Deane. 1976. Puhi (Eel in Hawaiian). Marine Aquarist. 7(7):76. Hemdal, Jay. 1986. 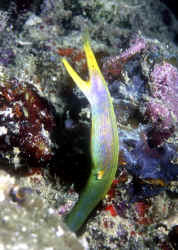 The Ribbon Eel (Rhinomuraena quaesita). Freshwater and Marine Aquarist. 2/86. Howe, Jeffrey C. 1997. Original Descriptions (column). Siderea flavocula Bohlke and Randall 1996. FAMA 12/97. Margaritas, Anargyros. 1988. Sea Serpents in Your Home. Tropical Fish Hobbyist. 11/88. Michael, Scott W. 1996. Fishes for the marine aquarium, pts. 22, 23; The morays- serpents of the sea. Aquarium Fish Magazine 7,8/96. Neal, Tom. 1994. Keeping the Ribbon Eel. Tropical Fish Hobbyist. 5/94. Nelson, Joseph. 1976. Fishes of the World. John Wiley & Sons.